This post may contain affiliate links, which allows me to earn a small commission if you click on the link and buy something. 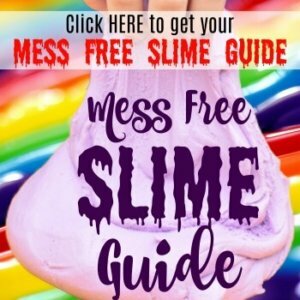 This help keep this blog content free to you! Recently, I was tasked with making a big Christmas centerpiece. I thought and thought about what to put under the centerpiece as a base that wouldn’t be too obtrusive or noticeable. I needed something that would go with it. I thought about using foam board or maybe a disposable cookie sheet covered in shredded coconut to look like snow. Then, I realized the perfect thing would be a peppermint plate of sorts. 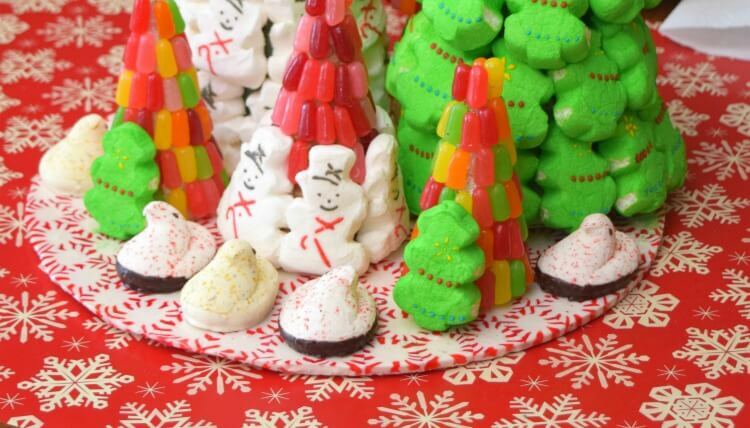 I remember seeing people making melted peppermints into Christmas ornaments with cookie cutters and small peppermint saucers. I figured if they could make little ones, I could probably make a giant one with my deep dish pizza pan. It’s my mom’s. She gave it to me years ago when she wanted to throw it out. They got it as a wedding present, and they were married in 1973, so it’s more than 40 years old. It’s been well loved, and it’s older than me! I used to use that pizza pan all the time to make cookie pizzas for my friends and my boyfriend in high school. The minute she wanted to give it to me when I was married and had my own house, I took it. I’ve been looking for a new one ever since, and for the size, I just can’t find one that isn’t sold by some commercial place. It’s like a large pizza size, about 16 inches I think. The closest thing I can find is this 12-inch springform pizza pan from Wilton that I put on my wish list and I’m pretty sure arrived via Amazon for my husband to give me for Christmas. 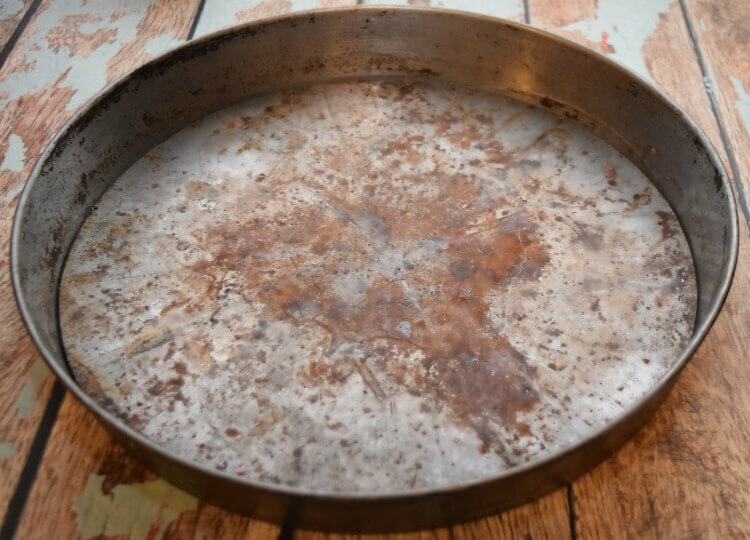 Now I have this other idea that as long as you cover a pizza pan with parchment paper, you could probably use a regular one like this pizza pan. 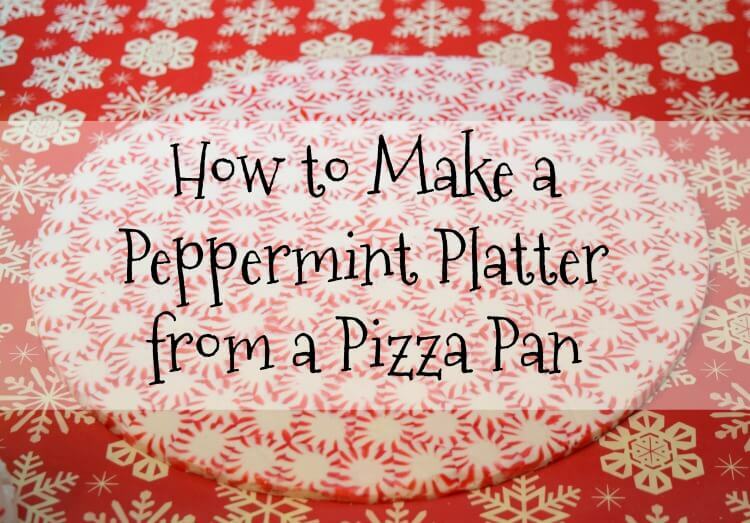 So back to the peppermint platter! I cut parchment paper in two pieces, because none was wide enough. I made two overlapping partial circles of parchment paper that I traced from the removable bottom of the pan. 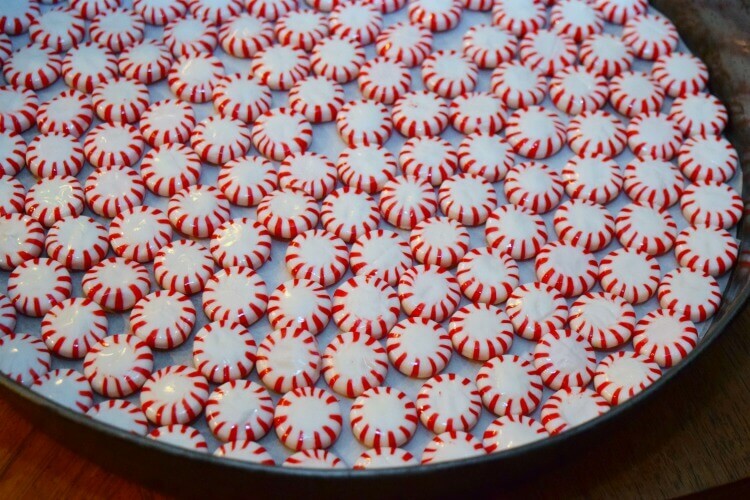 Then, I laid those on the bottom pan and began opening starlight peppermints. It took about 2 1/2 bags of peppermints. I did not count, but I bought 4 bags at Dollar General, each were a $1/bag. My 7 yr old and I laid them out in concentric circles until we filled the entire pan. Then, I baked it at 350 F degrees for about 10 minutes. I had read people started checking at 5 minutes, but my peppermints weren’t even melted at that point. By 7 minutes, they were getting there, but it wasn’t until about 9-10 minutes that they formed an entire smooth surface. The one thing that is MOST IMPORTANT is you have to keep watch and remove it before bubbles start to form because the bubbles will ruin it and make it very brittle. I removed it from the oven and let it sit for about 10 minutes before I popped the bottom pan out of the sides so it didn’t stick. 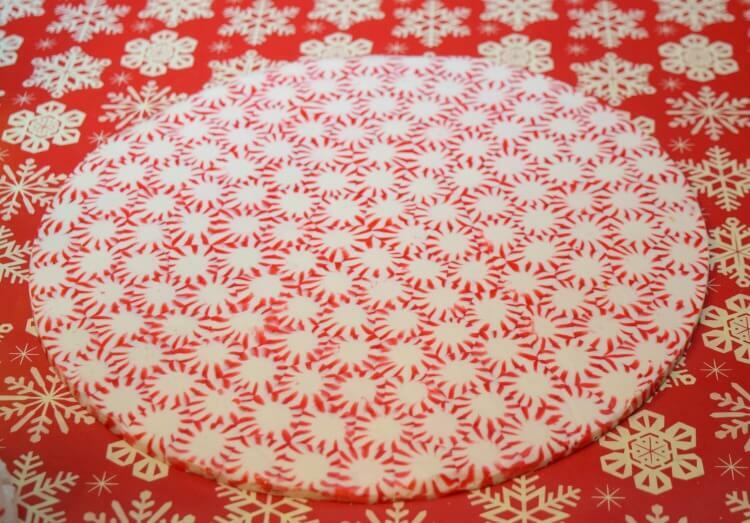 Then after another 10 minutes or so, I slide the parchment paper and the peppermint platter off the bottom pan. It worked perfectly! My husband and kids were mesmerized with this platter. I’m wondering how long it will last before one of them either A) licks it, B) eats it, or C) drops it. So far, it’s going strong! I think we’re probably going to use it for Santa’s cookies this year because it really is so dang cool! 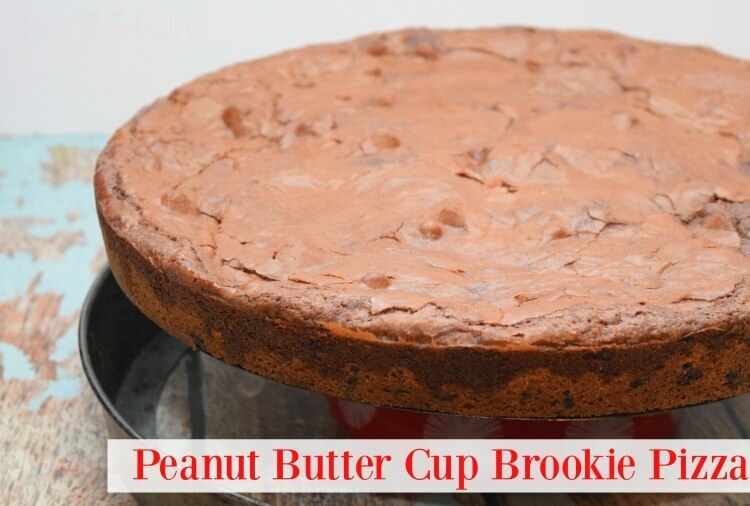 Here’s what else you can make in a deep dish pizza pan with a removable bottom! 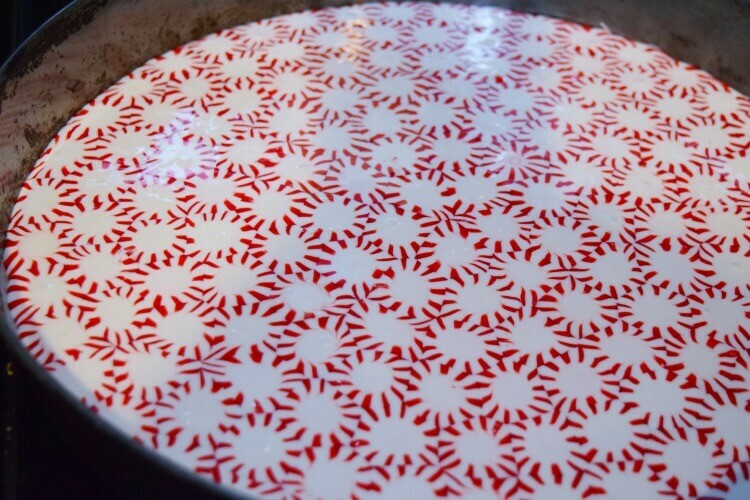 Have you ever made a plate out of peppermints or other candy?